Posted 24 January 2015 & filed under 19th century, Early 20th century, Life and leisure, Post World War 2, River Ver, Schools, Sport. 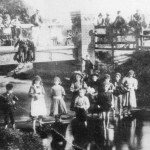 The open-air swimming baths in Cottonmill Lane were opened on 29 July 1905 on the site of the old cotton mill. However, bathing in the river took place long before the baths were built. There was a bathing facility established on the site in 1883, and on the 1898 O.S. map, by the Cottonmill Bridge one can see the word Baths so it was a recognised facility. The baths then were part of the river. The banks of the river were lined with wooden planks in an area which had a suitable depth for swimming. The bathers,changed on the riverbank and a hut was constructed to give them some privacy. The river must have been quite deep at that time as diving took place from a concrete platform. 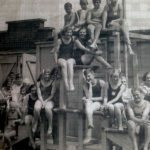 This bathing facility probably did not last very long as the lack of a decent, clean place to swim led to a public campaign led by Alderman George Slade to rectify the matter. He did not live to see them opened but his son, Horace Slade, who was also the Mayor (and local hat manufacturer) proudly gave an address at the opening ceremony. A detailed account of the campaign and opening ceremony can be found in Sopwell, a history and collection of memories. Many residents remember the pool with mixed feelings as they were unheated and open to the elements. Swimming galas were held in the pool every summer and schools sent the children there to swim. Unfortunately as it was not heated , it could only be used for about three months of the year. Apparently it was so cold that fingers and toes often went numb. Many children learnt to swim there and loved it despite the cold. Conditions were primitive compared to the luxury of a heated indoor pool. Swimmers remember being given brown paper bags to put clothes in and a metal number badge with safety pin in exchange. The bags used to disintegrate and were later exchanged for wire baskets.They changed in old wooden cubicles. 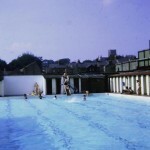 The pool was 25 yards (approx 22.5m) long and had an 8ft 6ins (approx 2.6m) deep end. There was a diving board and at for some time there was a water cascade and slide. When they got beyond repair these were removed. Many remember an officious pool attendant with a bamboo cane and whistle who used to stop any horseplay. In 1979, the County Education department decided to stop swimming lessons in the Cottonmill pool. 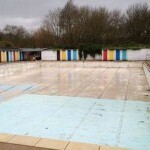 The use of the pool had diminished and it was said to be wasting money. Then with the opening of the Westminster Lodge leisure centre, the baths were eventually closed. The premises are currently used by the St Albans Sub-Aqua Club, familiarly known as ‘the dive club’.